Spasms in smaller arteries caused restricted blood flow in a patient's heart where indicated by the arrow, left. 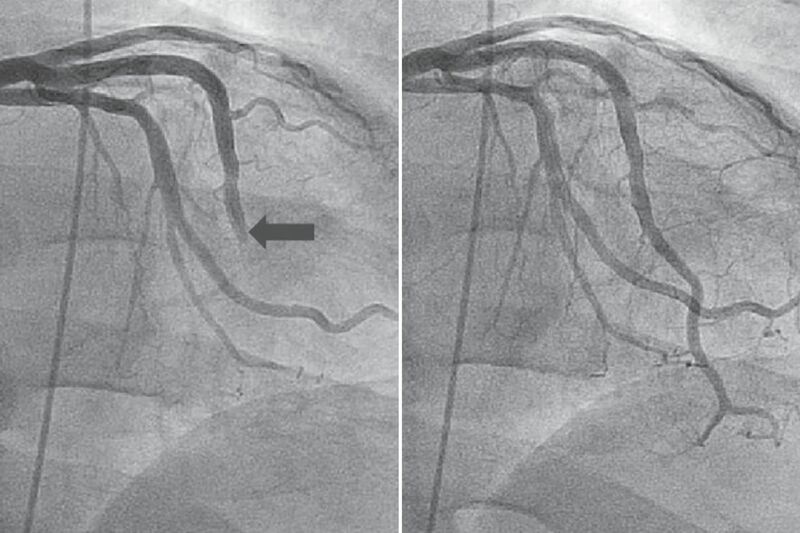 Normal flow was restored with a generic drug, as reported in the Journal of Invasive Cardiology. If you feel chest pain, get to a doctor fast. Nothing you’re about to read below should dissuade you from that common-sense advice. That said, this worrisome symptom often does not mean a heart attack. Chest pain can be the result of other problems in the heart or lungs, a muscular ailment, or even indigestion. In a new study, Jefferson University cardiologists described an unusual condition in which the patient feels pressure or tightness in the chest — the classic sign that coronary arteries are blocked by a clot or restricted by the severe buildup of plaque — yet those key blood vessels appear normal. Instead, the symptoms are caused by sudden spasms in tiny heart vessels that lie downstream from those main arteries, causing them to clamp shut and restrict blood flow to the heart, the authors reported. The cause of this phenomenon, called coronary slow flow, is not well-understood, though it seems to occur more often in smokers. But in the study, the Jefferson physicians said they had identified a generic drug that relieves it almost instantaneously. Nicardipine, a type of vessel-dilating drug that is prescribed to people with high blood pressure, restored normal blood flow to the heart in all 30 patients to whom it was administered, the authors reported in the Journal of Invasive Cardiology. “It’s very dramatic,” said senior author Michael P. Savage, director of the cardiac catheterization lab at Jefferson University Hospital. This condition was first described in the medical literature more than 40 years ago, but many physicians remain unaware of it, Savage said. He cited an informal poll he conducted on Twitter, asking his followers to look at X-ray images of a heart with this condition, and also the fact that he has diagnosed it in patients who come to him for a second opinion. Coronary slow flow may account for up to 4 percent of hospital admissions for sudden, unexpected chest pain, wrote the researchers, who included first author and cardiology fellow Hetal H. Mehta. The study drew praise from interventional cardiologist Tim A. Fischell, a professor of medicine at Western Michigan University and at Michigan State. He said that he, too, had given nicardipine to a handful of such patients with success. “There needs to be increased awareness that this is one of the possible causes of chest pain without a heart attack,” Fischell said. Savage said he and his colleagues decided to try the drug because X-rays of these patients' hearts resembled images of those with a different heart condition called no-reflow. That can occur in patients who undergo a balloon angioplasty to open a blocked coronary artery. Small particles of dislodged plaque can travel downstream to tinier blood vessels, causing them to spasm. Nicardipine, a type of drug called a calcium channel blocker, has been shown to relieve that condition, so Savage and his colleagues reasoned that it also might work for coronary slow flow. After all, the heart’s tiniest arteries appeared to be going into spasm in coronary slow flow, too, even though physicians could not say why. “The light bulb went off,” Savage said. The cardiologist cautioned that a controlled study of the drug would be needed to prove its effectiveness for treating coronary slow flow. He said such a study was unlikely to occur in part because the drug is generic, so there would be little financial support. But because it generally causes no side effects, nicardipine seems like a good option for someone suffering this type of sudden, unexplained pain, which can last for up to 20 minutes at a time, he said. Previous studies have found that most people who experience coronary slow flow will suffer from it again, and some end up in the hospital. In severe cases, the condition can even lead to a heart attack. The drug was administered by catheter in the Jefferson study, but it might make sense for such patients to take it orally at home, Savage said.